Whatever your need, the Aria Twin Storage bed has it! Smart Casual Transitional styling combines incredible amounts of storage & function. Whether you wish for a super storage USB power bed or you desire the super storage USB power bed wall, this offering has it all! The Aria is done in select okume veneers & Asian hardwood solids in a Sherwin Williams "Graphite" finish. The unique & versatile Valet Chest can be used as bunching pairs, flanked on each side of the bookcase storage bed or used as a freestanding storage chest. Valet Chest sold separately. Complete with USB and power outlets to charge your favorite electronics. 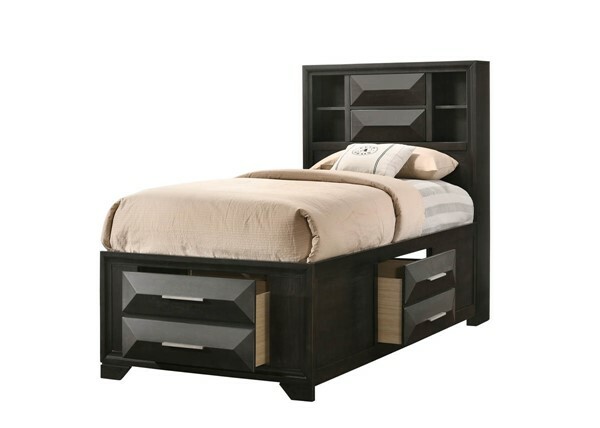 Three double-deep bed drawers provide tons of additional storage space.